Recently, I received a message from a client who wanted to order her astrological natal chart. The usual questions followed, “What is your DOB, exact time of birth, and place of birth?” She reviewed her birth certificate and did not find a birth time listed. For weeks, I pondered, “I’ve never attempted chart erection. Is this something I can do accurately?” . For the non-astrologer, this may seem confusing, but just stay with me. Above, you will notice a pie graph, which is actually an anonymous astrological birth chart. Beside it, I’ve also added the pie graph with it’s assigned meaning of houses. Each slice (house) on the pie is a different life aspiration. 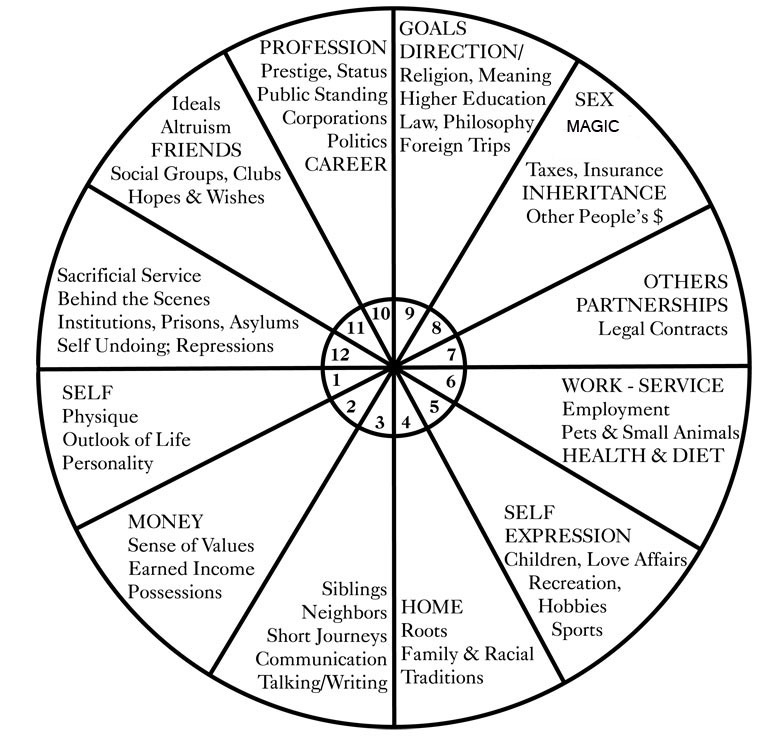 In addition to astrology, I am also a Feng Shui practitioner, and I liken the astrological chart wheel to the Bagua Map in Feng Shui: each slice or block represents a different life area. The birth time is the beginning point of the entire graph. Do you see the red horizontal line on the left of the graph? It lies just above the number 1. This is the beginning house of the chart. It is your Ascendant or Rising Sign, and it changes every 1-2 hours. The ascendant sign reflects your appearance, physical constitution, early environmental influences, & your physical birth experience. The astrological ascendant shows the mask you wear in unfamiliar situations; thus, it is actually the astrology sign most people associate with you. This is why sun sign astrology often doesn’t match people’s temperaments. The sun sign is really only revealed to people who know us. Therefore, the Ascendant sign is the superficial, outer layer of a person, while the sun sign is the deeper core of a person. Do you see the symbols (planetary glyphs) inside some of the houses? The houses containing planets reveal the type of energy being focused and where that energy is being focused. As the birth time changes, the planets shift to different houses. So in order to get my client’s entire chart and energy focus right, I needed the correct time. So, I was left with a 9.5 hour window to find the correct time. I felt like I was playing chess with 2 pieces against an entire army. The consistency and accuracy of my work is very important to me. Considering I’d be writing a 10-20 page astrological chart report based on my configurations, accurate birth time was mui important! Within the given time window, I was looking at the astrological signs of: Virgo, Libra, Scorpio, Sagittarius, & Capricorn. Fortunately for me, I had the advantage of meeting my client once as part of a group interaction. By the end of our hour long interaction, I was able to rule out Scorpio & Sagittarius. How? Scorpio Risings are very intense, quiet, and absorbing. They never reveal much about themselves to strangers because that would make them vulnerable. Their appearance is stylish, yet conservative and subdued . They do not wish to attract undue attention. Their magnetic energy draws people like moths to a singeing light bulb, however. Sagittarius Rising is quite the opposite! Dressed athletically, Sagittarius Rising bounces into an unknown situation gregariously talking up their visions and philosophies. The woman I had encountered was colorfully, artistically dressed. She wasn’t necessarily flashy, but I could tell her colors, jewelry, & style were all very thoughtfully considered. She was decidedly feminine in her demeanor. Her personality was shy with a touch of self effacement, but she was charming, nonetheless. She was an instantly likeable person. These details hinted of Libra. I formulated a few more leading questions, looking for additional clues. She spoke of her relationships, retirement from the postal service, and difficulty with medications and medical diagnosis. She also mentioned being psychically sensitive. NOW, my strategy was becoming clear! Relationships: Libra; Postal Service: Gemini/ Mercury/3rd house; Nebulous medical diagnoses, sensitivity to medications: Pisces/Neptune. After adjusting the birth time several times, I committed to 3am. This time set her astrological chart with Libra Rising, overshadowed by Neptune sitting on the ascendant 1st house. Neptune added a mystical, psychic, otherworldly layer to the personality. Due to the sensitivity, the person may be perceived as shy and withdrawn. In the 1st house, Neptune shows allergy sensitivity, adverse reactions to medications (including mood altering substances) and difficult -to- diagnose illnesses. Mercury, planet of communications, letters, & paperwork, fell in the 2nd house:. The 2nd house shows how we make money. Lastly, Venus in the 3rd house. Here, Venus loves short distance travels, communications, and writing.